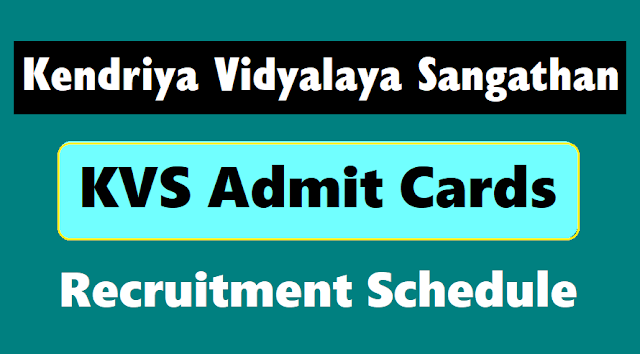 KVS Officers, Librarians, Non Teaching Staff Admit Cards 2018 /Kendriya Vidyalaya Sangathan Recruitment, Kendriya Vidyalaya Sangathan Admit cards, KVS E Admit Cards, KVS admit card for officer, librarian and non-teaching staff exam 2018 released: The Kendriya Vidyalaya Sangathan (KVS) has released the admit cards for the examination to recruit officers, librarians and non-teaching staff. The computer based online examination will be held from February 19 to 23 and February 26, 2018. Step 2: Click here to download admit cards for KVS recruitment examination for old candidates. Login through existing Application Reference No. with existing Password i.e. Date of Birth in DDMMYYYY format. Candidates must carry their admit card for the examination along with an original Identity proof. Any issue regarding the admit card can be solved through the helpdesk, kvshelpdesk.2017@gmail.com or toll free number 18002663091 on or after February 8. E-Admit Cards will be sent through registered e-mail ID from. 04.02.2018 onwards to all the provisionally eligible candidates. In addition, SMS alert will also be sent to the registered mobile number of candidates. Candidates are required to download the admit card, take its print out and appear in the examination as per reporting date/time mentioned in it along with one ID proof, in original. The admit card can also be downloaded from KVS Website: "www.kvsangathan.nic.in" from 05.02.2018 onwards. Any issue relating to admit card in respect of said recruitment, Helpdesk: kvshelpdesk.2017@gmail.corn or Toll Free Number 18002663091 •n or after 08.02.2018 may be contacted. 1. For new candidates: Login through existing application reference number with an existing password (same as used at the time of filling up of application form). 2. For old candidates: Login through existing application reference number with existing password i.e. Date of birth in DDMMYYYY format. 3. Candidates must take the admit card and ID proof to the examination centre, failing to which, they will not be allowed inside the examination hall. 4. The exams will commence February 19 and will end on February 26. They will be conducted at 76 centres across the country.